CentOS 7 is out and I wanted to test it on real hardware. Unfortunately most of current methods to transfer bootable ISO to USB key in MS windows environment do not work (see quote below) or boots, but does not recognize installation media in case of Fedora LiveUSB Creator (suggested in RHEL 7 Installation guide). After applying method of trial and errors I’ve discovered that best tool to transfer ISO to USB key is Win32DiskImager. Note: Writing ISO image to USB drive overwrites all data on the drive. 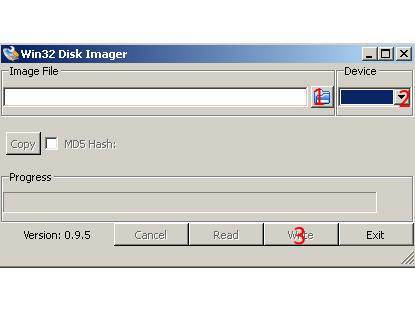 Put the path to downloaded ISO image in image file(1), choose USB key drive letter (2) and press write(3). Now you are ready to boot and install from your USB key. 1 Pings/Trackbacks for "How to create bootable USB key for CentOS 7 installation"